Wendi Zwaduk - Romance to make your heart race: Lovely Blog Award! My pal from Menagerie Authors, Kealie, gave me this lovely award for my lovely blog. How cool is that! 1. Accept the award, along with the person's name who gave it to you and their blog link. 2. Pass the award to other blogs. 3. Remember to contact the other bloggers to let them know they've been chosen for the award. So, now I get to pass it along. 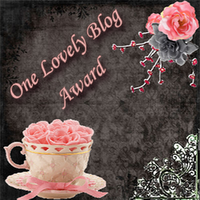 :-D My three choices for the One Lovely Blog Award are: Linda McMaken, Ashley Ladd, Three Wicked Writers.